Soul food from the Southern U.S. of A has been creeping onto menus in Vancouver for the last 2 years. I have enjoyed discovering the comfy soul soothing nature of grits, but the one dish that I have not delved into is Chicken & Waffles. This sweet and savoury combo perplexes me. In my head the two together don’t make sense but as my friends point out how is this different than sausage and pancakes? It’s not any different, except I grew up eating one combo since I was 6. Perhaps it’s simply time to sample this dish, as it seems like it is the new alternative to eggs benny for brunch. While I try to acclimatize my palate to this Southern staple, I might as well rumble it! Let’s start with Yolk’s as I think they may have been the first to bring this American import to the city as a permanent special out of their original food cart. Instead of going to their mobile eateries, I managed to snag seat at their breakfast, lunch & brunch only bricks & mortar site on Clark & Hastings. The dish comes out in an impressive towering stack. Once deconstructed, there was enough chicken to cover the surface of both waffles; I was satisfied with the ratio. The boneless chicken was extreme juicy on the inside and crunchy on the inside, without any hint of extra greasiness. This was great fried chicken. Much like the chicken, the waffles were prepared well and topped with icing sugar. The only thing that I wasn’t keen on was the gravy. I didn’t seem to be robust and umami rich enough to stand up to the sweet syrup and confection sugar. Jackalope’s Neighborhood Dive is a charming but eccentrically decorated bar that serves brunch on the weekends near the new casual eating hot spot of Hastings & Nanaimo. There are Jackalopes present in the joint. I’m trying to think of the 80s/90s TV show that made the Jackalope a household name for those in their thirties. Was it Full House? Anyways Jackalope’s rendition was a skillet fried chicken on a massive waffle. The ratio of chicken to waffle was way off; too much waffle not enough chicken. The chicken was not all that crispy or moist inside. Also I wasn’t a fan of the gravy provided either, something just didn’t taste right. The waffle was great with the syrup and I think paired with traditional toppings of fruit and Chantilly cream this thing would be great. 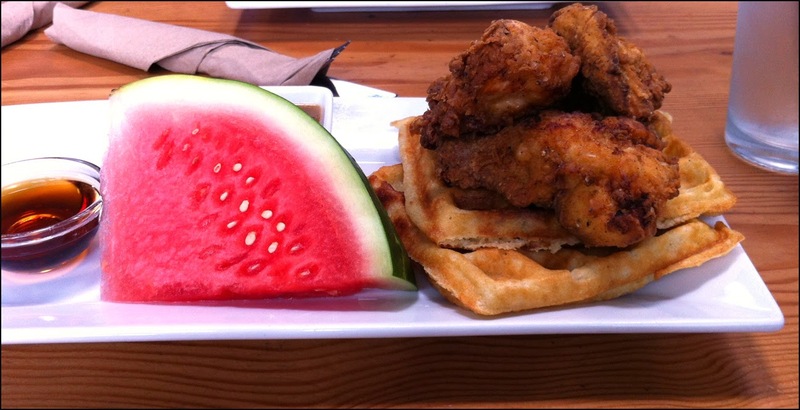 Unfortunately, I ordered Chicken & Waffles, this version simply wasn’t good enough. I was impressed with the juicy chicken that amply matched the portion of waffle in the dish. The chicken had a satisfying crunch. I like both the syrup and gravy that came with the dish. The gravy was deep and rich and matched the sweetness of the syrup. The issue I had with Portland Craft version I had was the waffle; they were soggy. With the chicken placed on top I think the waffle just wilted under the heat from the chicken. Overall, the waffle wasn’t as good as the other rumble participants. Based on my criteria I listed, the winner of the Chicken & Waffle rumble is: Yolk’s Commissary. With the only minor issue being the gravy, Yolk’s nails every point I was looking for. Portland Craft comes in a strong second and I think if they can improve the waffle they could seriously contend with Yolk’s for top spot. 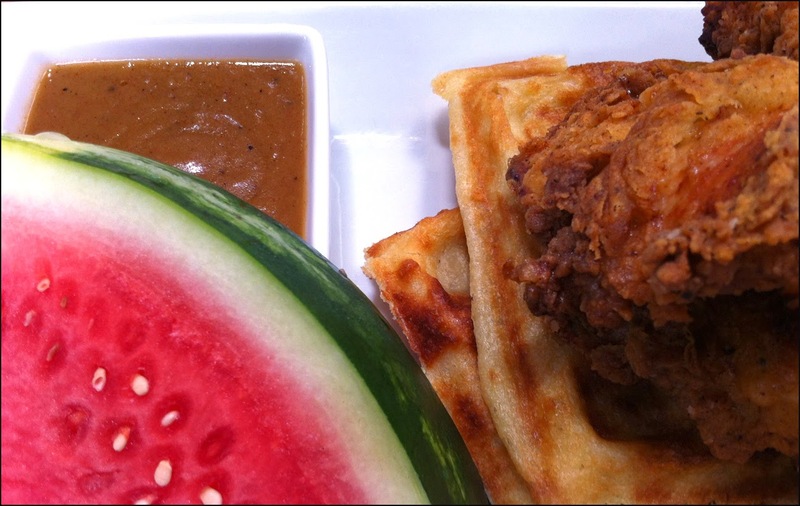 Sadly I think Jackalope’s Dive should consider removing the Chicken & Waffles dish from their brunch menu and strictly focus on more traditionally sweet toppings for their big and yummy waffle. Chewies oyster bar in Kits compares or in my opinion is better than Yolks. I go there for brunch and they also have it on their dinner menu.